When visiting the island of Crete, Chania seem to be the first place to be in, not only for its picturesque views but also to experience the true rustic Cretan style and hospitality. When wandering around the amazing city of Chania you will feel the area’s magic taking over you. Located on the north-west Crete, this glorious city has a population of about 60.000 residents, thus being the second biggest city of Crete after Heraklion. Chania City lies along the north coast of the island, about 70 km west of Rethymno and 145 km west of Heraklion. Divided in five provinces: Kydonia, Apokoronas, Sfakia, Selino and Kissamos you may find that this is a Greek on earth paradise. Chania City is built over the ancient Kydonia -the most powerful city of west Crete in ancient times- will make you fall in love with the whole island of Crete. Chania City preserves most of the characteristics of the Venetian period which gives the city a different style. 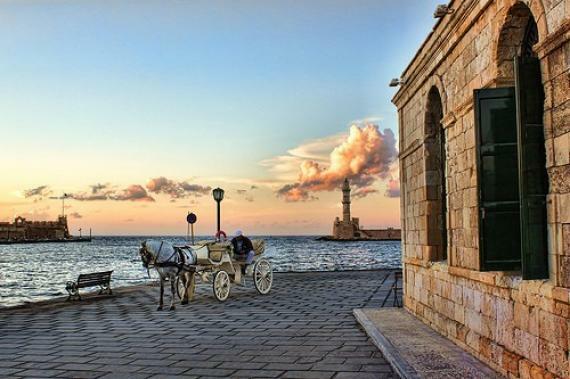 Divided in two parts, the City of Chania -the old town and the modern city which is the larger one- makes every visitor find something to adore in the area. The old town -situated next to the old harbor- used to be surrounded by the old Venetian fortifications of which the eastern and western parts have survived. However the center of the modern city is the area extending next to the old town and especially towards the south and has something for everyone. The imposing Lefka Ori mountains that rise on the south of Chania city and span on to the south coast of Crete to Libyan Sea, well known for their numerous gorges, among which is Samaria gorge of 16km length, the longest in Europe, are of great interest. Most visitors fall in love with local cretan cuisine and beaches. When in Chania you have to swim in Elafonissi and Falasarna and take the mountain road to get there that might be a bit slow but gives you the chance to take a quick look at the spectacular villages and gorges. Find information about selected Hotels, apartments and rooms in Chania City to choose the perfect place for your accommodation.